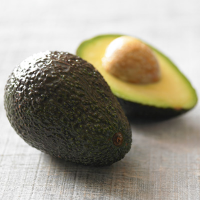 Scoop about a tablespoon of the flesh of each avocado half to create a well large enough to fit the egg. 2. Crack one egg into the well of each avocado half and place each half into a baking tray, ensure that they are tightly packed so the egg stays in the well. 3. Bake in the oven for 10–15 minutes for a runny yolk, or longer if a hard yolk is desired. 4. Once cooked, sprinkle the chives over the top and dust each half with a little paprika.